Take a look at this pillar. 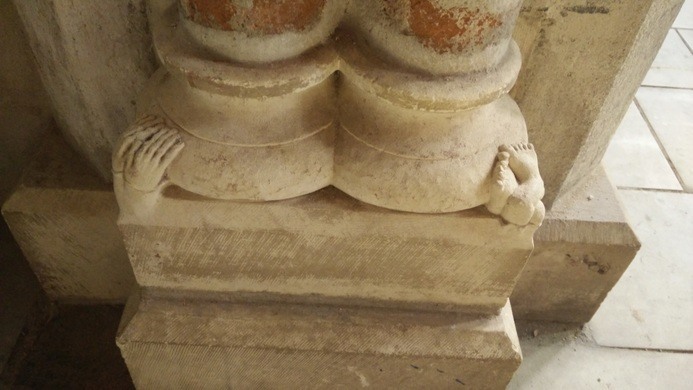 This pillar with the little man crushed under it can be found in the Church of the Jacobins in Toulouse, France. I read about this oddity in this article from Atlasobscura. The Church of the Jacobins is in the center of the city of Toulouse in southern France. It is a Gothic mass of brick and stone, decorated inside with elaborate trompe l’oeil and soaring pillars. Most famously, it houses the remains of St. Thomas Aquinas. A lot less famously, it has this strange little carving of a man trapped under one of the pillars. The remains of Thomas Aquinas are entombed in a golden reliquary along the side wall of the nave. Just behind it to the left there is a double-column that sits on a square base. Look down towards the floor and you’ll see, sticking out, a peculiar pair of bony hands and chubby crossed feet, their meaning and origin unknown. Some of the church tour guides don’t even know the crushed little man is there. The church dates to the early 13th century, founded by the French Dominican order of the Jacobins. 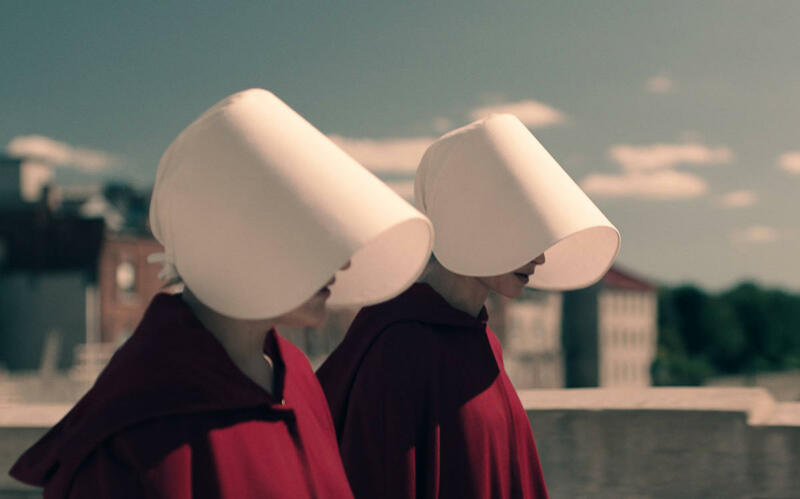 It has weathered a complicated history, beginning with the Dominicans being outlawed in France during the Revolution. It then began a journey that included everything from a takeover by Napoleon (who used it as barracks and an armory for the military), a period as a school gymnasium, an exhibition hall, and, during World War I, a safe haven for art treasures from the Paris museums. The later decades of the 20th century saw enormous efforts to bring back the majesty of the church. After periods of major restoration – including the reveal of medieval paintings that had been whitewashed by Napoleon – it has emerged as an important museum and cultural center for Toulouse. But the little carving remains a mystery, the only one of its kind in the church. Posted, you might say, without comment. It’s a little hard to find the little man, but look behind the St. Thomas Aquinas golden altar. You’ll see his little squished hands and little squished feet at the bottom of the pillar to the left. I wonder what the sculptor was thinking. Does the crushed little man have any relation to Thomas Aquinas? Aquinas was one of the Catholic Church’s most prominent theologians who did much to codify Catholic doctrine. His philosophical system, Thomism, is still used by the Catholic Church and even other Christian denominations to some extent. Maybe the little man represents Truth crushing ignorance, or the Devil being crushed by Christ. 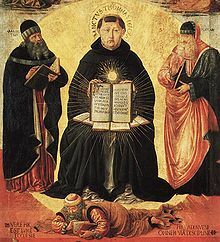 Here is a painting of Thomas Aquinas overcoming Averroes, a Spanish Muslim philosopher who helped to reintroduce Aristotle to the West. Presumably the painter considered Thomas Aquinas’s interpretation of Aristotle to be superior to Avarroes’s. Maybe the crushed little man represents the same idea in stone. Or maybe it was just a joke. Maybe the artisan who was carving out the base of the pillar thought it would be funny to make it look like they stuck the pillar on top of a man. I wonder if anyone noticed or if the artist got into any trouble. I wonder what sort of person he was, or even what his name was. We will never know, but I think I’d like to meet him in whatever afterlife might exist and learn his story.